Adjara Autonomous Republic of Georgia is a strategically important region for Azerbaijan. This is a rapidly growing region in Georgia. Many neighboring countries are seeking to strengthen their presence here and Azerbaijan should not stay away from these processes. Thus, Azerbaijan and Georgia signed a contract on the construction of a terminal for mineral fertilizers in the Batumi port of Georgia in January 14. The American corporation Trammo together with the Wondernet Express Investment Group will invest $ 20 million in the construction of the terminal. 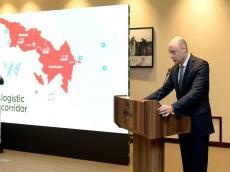 Georgian Economy Minister Giorgi Kobulia noted that thanks to the new terminal the volume of cargo from Central Asia will increase on the Georgian railways, and conditions will be created for the opening of new jobs. Noting the regional significance of the terminal, the minister said that the project will contribute to the growth of the economy of Adjara and Georgia as a whole. The project envisages the creation of a logistics corridor through the Black Sea port between the countries of Central Asia, Azerbaijan and Georgia. Wondernet Express Investment Group has already signed agreements with the main project partners - Georgian Railways JSC, Batumi Port, Azerbaijan Railways CJSC and Baku Port. The new multimodal terminal will be equipped with modern equipment, the storage capacity for mineral fertilizers will be 60,000tons. Construction of the terminal is scheduled to begin this spring. It will be able to process up to 1.2 million tons of mineral fertilizers per year. Diplomatic ties between Azerbaijan and Georgia were established on November 18, 1992. The two countries broadly cooperate in regional energy development, transportation and economic partnership projects such as Baku-Tbilisi-Ceyhan pipeline (BTC), Kars-Tbilisi-Baku railway (BTK), the TRACECA, the BSEC. Georgian exports to Azerbaijan include cement, locomotives and other railway vehicles, mineral and chemical fertilizers, mineral waters, strong drinks, glass and glass wares, and pharmaceuticals, among other things. Azerbaijani mainly exports to Georgia oil and petroleum products, natural gas, plastic wares, furniture and building constructions. Azerbaijani President Ilham Aliyev during his meeting with Georgian Prime Minister Giorgi Kvirikashvili, which took place in March in Baku, noted that Azerbaijan is on the first place in terms of the volume of investments in Georgia, which indicates a high level of interstate relations between the two countries. According to the National Statistics Office of Georgia, the trade turnover between Georgia and Azerbaijan made up $835,782,800 in January-October 2018.